The Winter/Spring 2018 issue of Inroads featured Marvin Shaffer’s article on British Columbia’s Site C dam controversy. In December 2017, soon after the issue went to press, the B.C. cabinet decided to complete the dam. However, it did not take long for a new energy policy controversy to take centre stage. Kinder Morgan has received federal regulatory approval and begun construction of its much-debated pipeline from Edmonton to Vancouver. In Alberta, all major players, in business, labour and politics – both Rachel Notley’s NDP government and the United Conservative opposition – support building this pipeline to gain ocean access for the diluted bitumen extracted from the northern tar sands. On the other side of the Rockies, the B.C. NDP promised prior to the 2017 election that it would do everything possible to stop construction of the pipeline. Now in government, the NDP has (at the time of writing in April) decided to submit a reference question to the courts over the province’s right to legislate further regulation to prevent environmental damage arising from increased tanker traffic. Does this amount to an insistence on imposing very high safety standards on a pipeline that, in private, the B.C. government knows it will ultimately accept? Or does the government intend to follow through on its campaign promise to wage guerrilla war against the pipeline? The answer is not clear. To date, the best guess is the first, but if political protest mounts, Victoria may switch to the second. Meanwhile, tempers are frayed as Canada’s two NDP premiers verbally assault each other, and Ottawa desperately wishes everyone would talk about something else. Other events have escalated the conflict. British Columbia has chosen this moment to announce construction of a major liquefied natural gas (LNG) plant in northern B.C., which will export to Asia. It rationalizes its export proposal to environmentalists with a claim that the LNG will be used in power generation and will replace coal, a fossil fuel emitting more greenhouse gases (GHGs) per unit of electricity than natural gas. Whether that will be the outcome is moot. From Alberta’s perspective, the B.C. government is guilty of rank hypocrisy. It wants the jobs and tax benefits from exporting B.C. hydrocarbon resources while it threatens to block Alberta hydrocarbon exports. Citing B.C.’s antipipeline rhetoric and intense opposition by some environmentalists and First Nation leaders, Kinder Morgan’s U.S. parent has suspended further investment in the pipeline and threatened to withdraw from the project altogether. In response, the Alberta government has offered, if necessary, to buy out the Canadian subsidiary to bring the pipeline to completion. In this issue, we have assembled three cogent interventions in the debate. Two have been published elsewhere, but bringing them together in one place will help those wanting to get beyond the phony war between the two provincial governments. The setting for this debate is the Paris Climate Accord under which, shortly after they won the 2015 general election, the Liberals committed Canada to reduce annual GHG emissions to 30 per cent below 2005 levels by 2030 (from 740 to 520 megatonnes of CO2 equivalent.) The first of the three position papers is by Andrew Leach, who has been central in defining Alberta’s strategy in the federal-provincial negotiations following Canada’s commitment under the Accord. Each province’s core climate change obligation is to implement a credible schedule of escalating prices for GHG emissions, something to which Alberta has agreed. However, Alberta has insisted that a pipeline providing ocean access for tar sands oil is part of the federal-provincial deal. If provinces, B.C. in this case, pick and choose what they like in the plan, he argues, the deal collapses – which potentially threatens survival of the federation. Mark Jaccard has no faith in the federal-provincial deal. He describes the last quarter-century of Canadian political discourse on climate change as Orwellian. Winston Smith, the hero of George Orwell’s dystopian novel 1984, works in the Ministry of Truth. His job is to revise past history according to the current strategy being pursued by Big Brother. Something similar has been taking place, says Jaccard, in Canada. Since 1988, Canadian prime ministers have promised to meet a series of GHG reduction targets. From Brian Mulroney through Jean Chrétien to Stephen Harper, they never intended to implement the aggressive carbon pricing and regulations required to realize these targets, and no one should be surprised that the targets have not been met. Justin Trudeau is asking that we forget past doublethink and the fact that Canadian emissions have continued to grow since the 1990s (except during the post-2008 recession). This time is supposedly different: Big Brother – in the form of Kinder Morgan, oil companies, Edmonton and Ottawa – is asking us to believe that building a major pipeline to enable expansion of Alberta tar sands exploitation is part of a credible plan to reduce GHGs. Common sense dictates that we be sceptical of the federal-provincial deal, a plan that all agree is far from adequate to meet the promised 30 per cent reduction. Already, the tar sands account for 10 per cent of Canadian emissions. Rather than promote a pipeline to expand tar sands exploitation, Ottawa could buttress its credibility by implementing substantial regulations that have the potential to make a significant reduction in emissions. Marvin Shaffer endorses, with qualifications, the case for the pipeline. Canada has a resource-dependent economy and in the short term would realize economic benefits from the pipeline, which enables diversification of export markets. Without ocean access, the United States continues as our sole major export market. Being the sole purchaser enables the United States to exercise a measure of monopoly power over the export prices we obtain. The United States is bargaining hard to increase its benefits from foreign trade; we should do likewise. Over the next three decades, as the world transitions away from fossil fuels, it is arbitrary to pick on one source of GHGs and attempt to block expansion of Alberta’s oil sector. Why constrain tar sands expansion as opposed to phasing out coal-based power generation across the country more quickly, or regulating new vehicle emissions more aggressively, or ramping up the promised carbon tax more rapidly? In addition to this sampling of the debate, Reg Whitaker offers a spirited argument against the pipeline in his column in this issue. 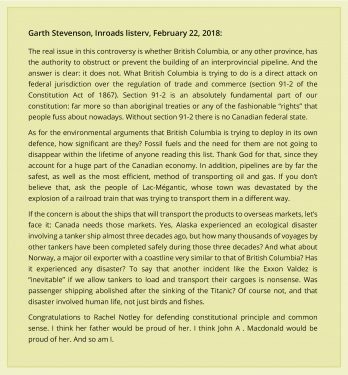 The pipeline debate also engaged the Inroads listserv in February, and we present two short posts from that exchange. Click to read The Great Alberta-BC Bitumen and Wine War by Reg Whitaker and Pipeline Politics by Philip Resnick. There is a link between this debate and Amy Chua’s Political Tribes, the book I review elsewhere in this issue. Her argument is a variant on David Goodhart’s “somewheres vs. anywheres” thesis in explaining the Brexit referendum outcome and Joan Williams’s “white working class vs. cosmopolitans” thesis.1 Overall, expansion of global trade over the last quarter-century has enriched the world and, on a world basis, slightly reduced income inequality, thanks to hundreds of millions in south and east Asia rising above dire poverty levels. However, the benefits have been so unevenly distributed in high-income countries that large constituencies within Europe and North America now favour an affirmation of national sovereignty and rewriting of trade agreements (such as Trump’s NAFTA negotiations). In addition to scepticism over free trade, these resurgent nationalist constituencies are dubious of major shifts in tax and regulatory policy to meet international climate change agreements (hence the support for Trump’s evisceration of EPA regulations on coal mining and mileage limits on auto manufacturers). In Canada, the majority in Vancouver, Toronto, Ottawa and Montreal probably oppose pipelines taking Alberta oil to ocean ports on either the east or the west coast. They also favour the federal-provincial agreement to price GHG emissions. To oblige the “cosmopolitan anywheres” by scrapping the pipeline will anger many “noncosmopolitan somewheres” convinced that the costs of climate change policy are being disproportionately loaded onto the oil and gas sector, located primarily in Alberta and Saskatchewan. The first victim of pipeline cancellation would likely be the Alberta NDP in the forthcoming election. The second victim might well be the federal Liberals in 2019. Nobody asked for my advice, but here it is anyway. My ideal solution would be an aggressive exercise of federal jurisdiction over the provinces on this issue. Scrap the complicated federal-provincial carbon-pricing arrangement – which is in danger of collapse anyway as a result of conservative opponents in Alberta, Saskatchewan, Manitoba and Ontario – in favour of a uniform, more aggressive schedule of rising carbon taxes over the next decade. Make this revenue-neutral through a cut in the federal personal income tax. Add some of the tough regulations that Jaccard wants. Affirm federal jurisdiction here and ensure that the pipeline is built – but only after climate change modelling suggests the tax and regulatory package is adequate to meet Canada’s Paris Accord obligation (with a pipeline in place before 2030). As I said, nobody asked for my advice, and doubtless no one will. 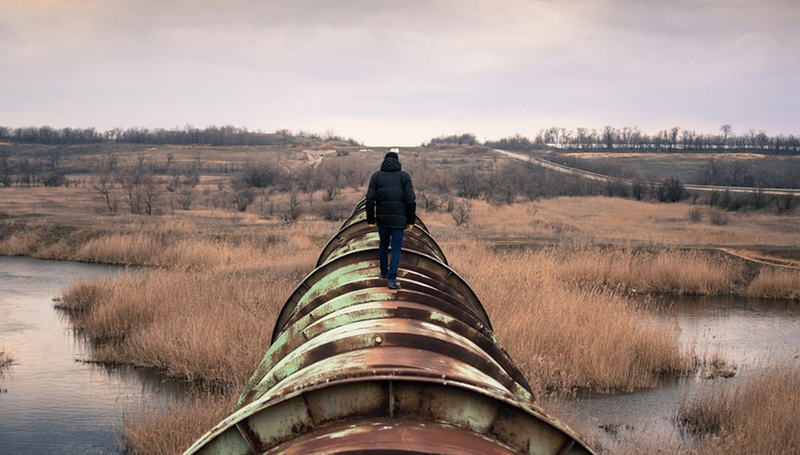 Click to read The BC-Alberta Pipeline Fight Could Undo Our National Climate Plan by Andrew Leach, Trudeau’s Orwellian Logic: We Reduce Emissions by Increasing Them by Marc Jaccard, and What to Do With the Elephant by Martin Shaffer.